Our hosts at Northern Arizona Wind & Sun (Rick and David), have updated the forum theme to follow the new NAWS Store Theme. http://solar-electric.com/ (our host's web store with new theme). Please let us know how this is working out for your (reading/posting/etc.) by replying to this discussion (aka "thread"). When I go to "new discussions", the the unread and the read look all the same... actually, unread is bold, but not very bold... hard to distinguish on my laptop computer. Before this new theme, the unreads were a different color. Ditto what vtMaps said. The unread threads do not stand out, and I was about to lambast the web weenie on the SW thread, but I can do it here just as well. They should have changed the store to match the forums, instead of alienating all the forum users and making us look up how to re-adjust the colors to something usable. They want our feedback. I have the same problems with my laptop, but others with desk top computers have plenty of contrast. There are, at least, three of us with poor contrast issues. We will have the developers read this thread so they can get your feedback. Our goal is to ultimately make the forum as user friendly as possible. It does not need to mimic the store website. We just needed a place to start. We will take all your feedback and suggestions seriously. Thank you very much. At first I thought it was broken or something... but then I noticed the "new" icon on any newly replied to topic. Maybe just a matter of getting used to it, though most forums do have a noticeable color change for the newest replies. A little more contrast of the area outlining the leave a comment field would be nice. Depending on the tilt of the display it can be very difficult to find the field when I want to leave a comment. I do like the store appearance. As Mountain Don said, tilt your screen, contrast should get better. At least laptop screens ARE tiltable. Seems like all your favorite internet sites make changes/updates on an ongoing basis which require us to get used to. No fun readjusting. 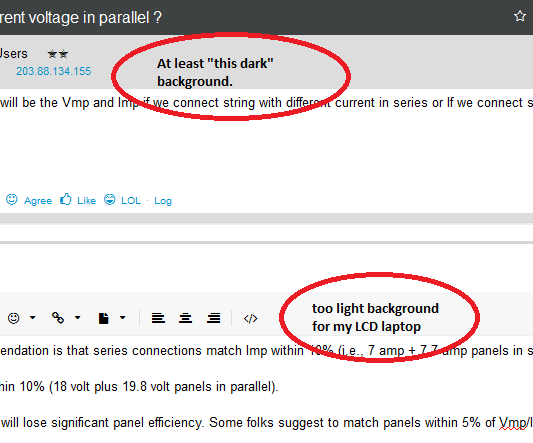 For me, there is the "darker background" (above example of "framed" posts) and the below example of "framed edit box". The framed posts are the "minimum" dark/contrast that I would suggest. The below framed text box is too light (on my LCD laptop monitor). I would suggest "darkening" the white space background for the forum... (or under-lay a nice Flagstaff bluffs image as base background--That would be very nice--Bluffs background "fixed", let rest of forum scroll as normal over background). Note: I have put in as a "Bug Fix" that "NEW X" does not show on discussions (threads) that have not been opened before (however, any new comment to an existing discussion does show "NEW X"). For now, I will focus on the theme colors to better highlight the "new" discussions. BILL, notice that after ''mark all read'' is used the background of all threads goes light gray making one think they have not been read, Ii think the old version went to white...?? Need to make the background contrast higher... As I recall, the "Not Read" discussions (threads) are "white background". The Read Discussions are (supposed to be) darker background (presently, too light of background for some of use using LCD laptop displays to see). Monday, I will ask NAWS (David and Rick) to darken the minimum contrast for the whole forum. There was some confusion between two different groups making updates to the forum (theme color adjusted, but then appeared to be overwritten by post numbering fix). If anyone still has problems with the new theme (background colors should be darker now--No light gray backgrounds that fade to white on some laptop screens), please let me know here. Add a link to the page that you have questions about. For example, the very light gray around this edit window is still too light color for me and looks almost white (like back ground). Thanks for getting the Post numbering addition. The border around the Leave a Comment box is still quite light -- very low contrast between the white background. It the contrast ration may well have been increased, but still a bit light. YES, am using a Laptop, and laying the screen flatter does help, as does placing one's chin on the keyboard. The color scheme looks better, sharper, perhaps. They will be darkening the input box boarder soon. How about the recent discussions page.... The unread discussions (in bold) don't jump out at me as much as I might like. Also, how's the bug fix, mentioned in comment #9, coming along? I asked about that... Vanilla said that is a feature, not a bug. I will see if we can get bigger font or make it blue green or something (avoid red/green color blindness). Depends on what list you look at. If you look at "Recent Discussions", it's just another thread. If you look at the Off Grid Forum, it's a sticky. "Announcements" are sticky (stay at top) for individual forums and/or the recent posts (new posts) listings. It depends on how I (moderators) have marked the discussion (thread). I just miss the old software - and the old theme. The old software was turning into a support nightmare. We had to change. And this was one company that would save our years of posting history. The theme change got sidetracked because of work on NAW's web store. Hopefully they will be back soon. I see the kids found the box of crayons again. We need to hide those better. Going to close this for now... What we have is what we are going to get for the present time.